In a land far away lived four greedy mice. Each thought only of what was could for themselves. They lived in a huge castle next to a wide river. Every day traders came to the village inside the castle walls and brought cheeses, breads, and cloths from other lands. The people of Prinda spent most of their time gathering wild berries in the woods and making jam. They were famous for their Prinda Jams. Every morning the four mice ran down to the gates of the castle to see what the traders brought that day. Some days they all carried loaves of crusty bread full of seeds and nuts. The mice loved to eat the bread and followed the traders to the shops. As soon as the bread was put in the back room, the greedy mice would fight each other for a loaf. The biggest mouse, Boret, usually got the biggest loaf. Jilma was a bit smaller than Boret and Hargon was smaller than Jilma. They got the next biggest loaves and left the smallest one for Yoba. Sometimes Boret finished his loaf and pushed Yoba out of the way and ate his loaf too. 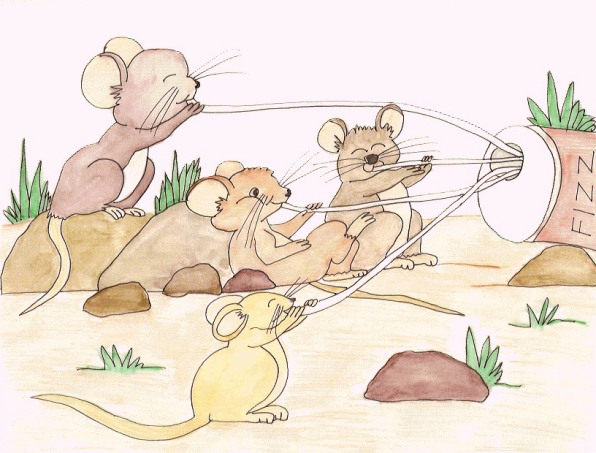 On the days the traders brought cheese, Boret rarely let any of the other three mice have any of it. He'd eat so much that his cheeks bulged and his tummy poked out. Jilma and Hargon would get nibbles, but Yoba never got any cheese at all. One fine summer morning as they stood waiting at the gates, they realized something was different. No traders came. The shopkeepers guarded their jars of Prinda Jams, but no traders came to buy any. Talk spread through the village that a dragon was blocking the path to the castle and that none of the traders were brave enough to try to get by and come to Prinda. “Jilma's right. We are too small,” Hargon said. But as the day lingered, their hunger grew. The mice sat in front of Yoba. “Tell us your idea, little mouse,” Boret said. The four mice ran through the village gathering as many jars of Prinda Jams as they could. They stacked them on a cart that they'd left outside the gate. When it was full, they climbed on the horse and it walked down the path. They left the cart of jam parked in the middle of the path and called to the dragon. “Oh stupid dragon. You can have this jam. It's not for you.” The mice ran and hid when the dragon walked towards them. They watched from behind a tree. The dragon opened the jars and poured the jam into its mouth. It emptied every single jar. When it tossed the last one down on the ground, it turned an awful shade of green and howled. “I've got a tummy ache.” It rolled around holding its belly and crying. Yoba, being a brave little mouse, ran over to the sobbing dragon. “If you go to the highest mountain and stay in the cave, your tummy ache will go away, but you must never ever come here again,” the mouse whispered in the dragon's ear. The dragon stood and flapped its wings. “I'm leaving. I'm never coming back.” Away it flew towards the mountains. “Good idea,” said Horgan and Jilma. The dragon never returned and soon the traders came back to Prinda. They brought many cheeses, breads, grapes, olives and roasted nuts. Boret and the other mice shared every last bite and at night went to bed full and happy.